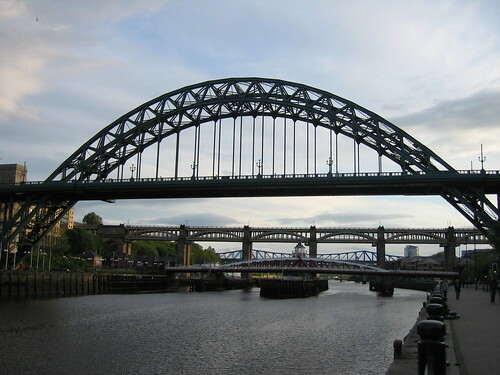 It seems to my that Newcastle Upon Tyne is know in part for it’s football team, and even more for its fans. But then it is also known for its bridges. Didn’t they make it onto the 1 pound coins? I lived in Newcastle for 2 years, then I went to Poland and came back for a semester (of which I actually spend most of the time in the south of France) to finish my Bachelors degree. Now it has been 5 years since I have not been back. 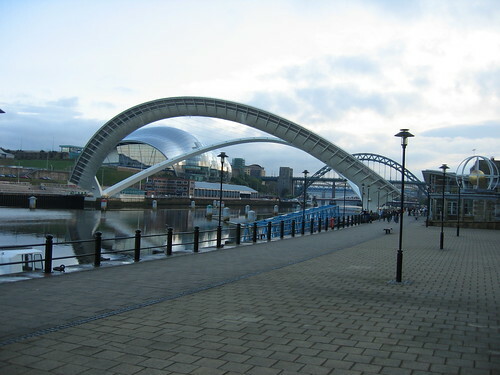 During my time in Newcastle I attended many concerts, and wrote a whole lot of reviews (not for every concert I went to, I did have to study a bit too after all) I had the chance to interview quite a few bands, and was a very active member of the student radio station. In my first year I hosted one radio show, and then in the second year hosted two, was head of music and was busy conversing with record labels and band managers. Once I went to a game of Newcastle United, which definitely is an experience. Did you know that you have to keep the score yourself?! Even though I was quite active, I must confess that I took my time before starting to explore the Toon to truly discover its soul. Well once I did, I was on fire, and took a lot of pictures, of which some have been lost, and others are still cherished and hopefully safe. In my second year I discovered that the beach was accessible by metro! I did a crazy photoshoot at Hadrian’s Wall wearing fairy wings, but never saw the outcome. I somehow managed to not see the angel of the north. And then I started going on exploring trips all by myself. I wandered through the non-student areas of town. Posh office districts, that had facades that reminded me of Paris. Steep streets and many hidden gems to photograph. 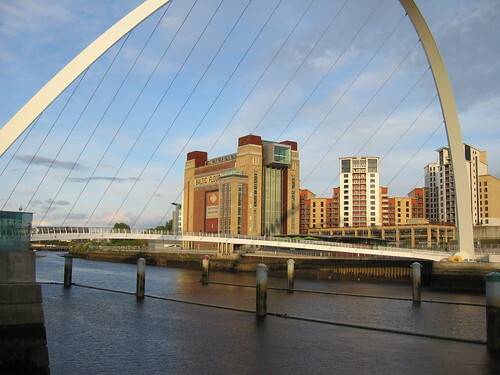 Walks by the Tyne river, made me awe at the beauty of this deindustrialized city. 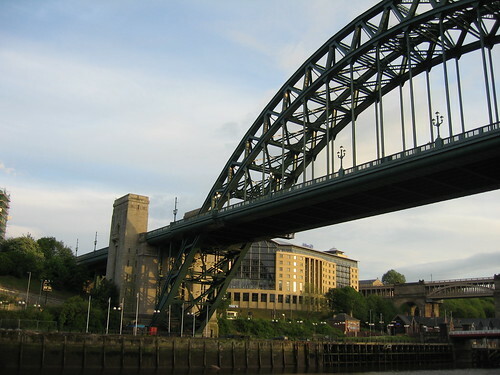 Today, I want to share with you some long forgotten pictures I took of the Tyne Bridge, the Millennium Bridge (I no longer remembered that it could flip to let ships pass), and the other bridges which span across the Tyne between Newcastle and Gateshead. I would like to thank both Ula and Gulara to have nominated me to participate in the Five Photos Five Stories Challenge. I met Ula through the A to Z Challenge, and then met Gulara through Ula where she was a guest. I would like to invite you to check out both blogs, which are truly inspiring and beautiful. This challenge has pushed me to rummage through my old photos, start properly backing up my pictures, and write a little bit every day. It has also helped me reflect on what I want to do personally and professionally. Today, marks my firth entry into the challenge, at the beginning, I said that I might do it twice, thus for 10 days. Now having already skipped a day, I have had a change in plans. I want to share old photographs and their stories every once in a while. Now, like the last few days, I am meant to nominate a fellow blogger to participate in the five photos, five stories challenge, but so many of the bloggers I follow and appreciate reading, have already joined. Thus today I would like the nomination to be open. Let me tell you, do it! It makes you explore so many different things. In certain ways New York is like Paris. Both cities make people dream. We want to visit and discover them. I discovered New York for the first time in 2000, we had been living in the US for a month and accompanied my uncle and his wife on their honeymoon trip to New York (they spend their honeymoon with us and New York was one of the excursions). This was one of many trips to the Big Apple. 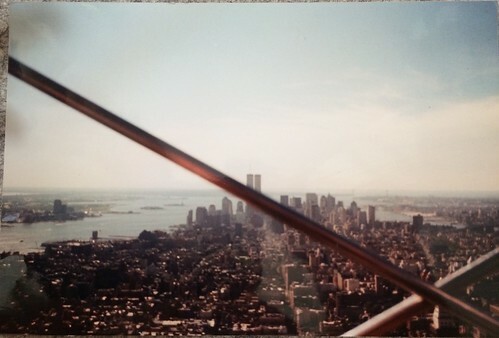 On this very first trip we “claimed” the World Trade Center and enjoyed the view. Over the years, many day and weekend trips would follow. I remember walking for hours (Paris is so small in comparison), ice-skating in central park and in front of the Rockefeller Center, having dinner in a very good Italian restaurant, being very cold in the winter, and very hot in the summer. I remember receiving a compliment for my skirt in a posh store. I remember “climbing” the Empire State Building in the day, at night, in the rain, in the sun. I remember taking taxis that felt like riding a marshmallow. I remember getting my makeup done and feeling like a princess for the whole night. In the summer of 2001, I went to New York twice. One visit was in the beginning of September, just before the school year started. I don’t really recall the trip. But I remember that we took the ferry from Staten Island. Which gave me an amazing view of the City’s skyline! New York is great to photograph (something that my rummaging through old photos tells me), that I took another picture of the twin towers from behind, probably from the Empire State Building. A few weeks later I had already forgotten about the pictures, so many things had happened. I was in shock about the recent events in New York. I was in shock regarding the fact that I had been in New York only a few days before the attacks. One day my mother brought home my pictures. 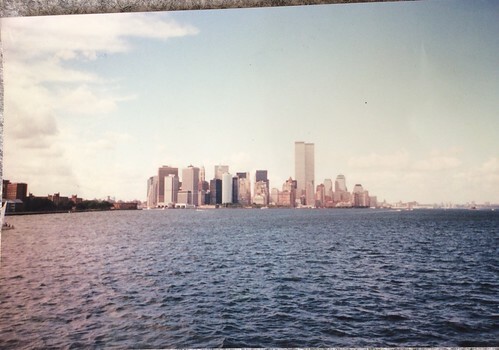 They were developed on the 8th of September 2001, and showed New York’s skyline as it no longer was. I would like to thank both Ula and Gulara for asking me to participate in the Five Photos Five Stories challenge. Please do check out both of their amazing blogs. This challenge (even though I did not post yesterday) has been a great one so far, thus I am going to invite Evelyne to participate. Not so long ago she posted a lovely story about New York herself. Her New York post was the reason why I thought of these pictures.